The Migration Wizard allows you to migrate your Info Pak project into the Server. In addition, you can use the Migration Wizard to enable display of Info Pak content from the website and to transform Info Pak documents and simulations to uPerform documents. The Migration Wizard allows you to migrate your Info Pak project to uPerform. 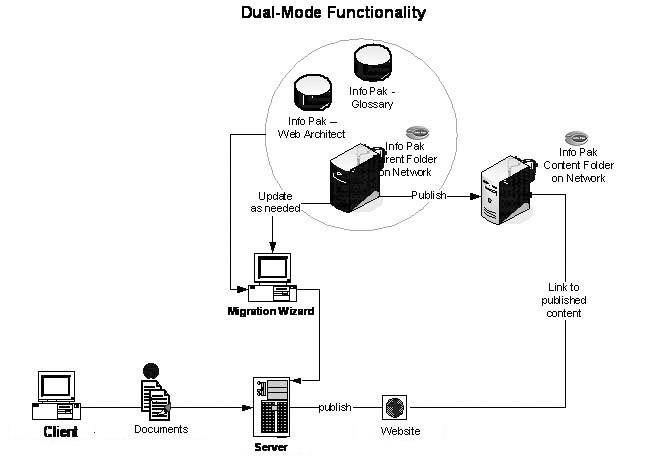 The Migration Wizard also allows you to link from your uPerform website to content created and published by Info Pak. Finally, the Migration Wizard includes functionality to allow you to transform Info Pak documents and simulations to uPerform documents. Your Info Pak - Web Architect and Info Pak - Glossary database information will be migrated to uPerform when you use the Migration Wizard. You can choose to have your Info Pak documents remain outside of uPerform and edit and publish these documents using Info Pak. Alternately, you can transform your Info Pak documents to uPerform documents that can be edited and published using uPerform . Migrates the Info Pak - Web Architect database content to uPerform, creating your document library in uPerform. The Migration Wizard creates placeholders to check in the Info Pak documents. It also creates your website structure to match the website generated by Info Pak. Migrates the Info Pak - Glossary database content to uPerform, populating your current terms and definitions in uPerform. Authors can then enter all new terms and definitions into uPerform for use in the uPerform content. Any terms and definitions that must also go into the Info Pak - Glossary for use in Info Pak documents must be entered in the Info Pak - Glossary as well. Creates links from your uPerform website. When navigating the uPerform website, the end user will view a uPerform-generated website that points to existing Info Pak and uPerform content that is glued together via links generated during the migration process. This form of linking to both Info Pak content and uPerform content is referred to as operating in "dual mode". Transforms your Info Pak documents and simulations to uPerform documents. You can then edit these documents and check them into the Server and provide them to your users via the uPerform website. If you will be creating new content with uPerform, but your end users still need to access Info Pak content, the dual-mode functionality allows you to leverage your existing Info Pak content on the uPerform website. As system changes occur in the application(s) you are documenting, you may elect to transform your Info Pak documents into uPerform documents. After transformation, you can edit the content as necessary. Your new uPerform documents are then checked into the Server and linked to the website. If you have a relatively small Info Pak content library (for example, less than 100 documents), you may want to transform your existing documents to uPerform and edit the content as necessary. You would then use uPerform to create your website hierarchy, manage glossary terms, and publish content. Going forward, you would create all new content with uPerform. If you have a large Info Pak content library, you may want to use the dual-mode functionality to continue to use Info Pak to maintain your existing Info Pak documentation that does not require change. Going forward, you would create all new content in uPerform. You would then publish legacy Info Pak content using Info Pak and publish uPerform content using the uPerform Server. Your end result is a unified website of Info Pak and uPerform content for your end users. 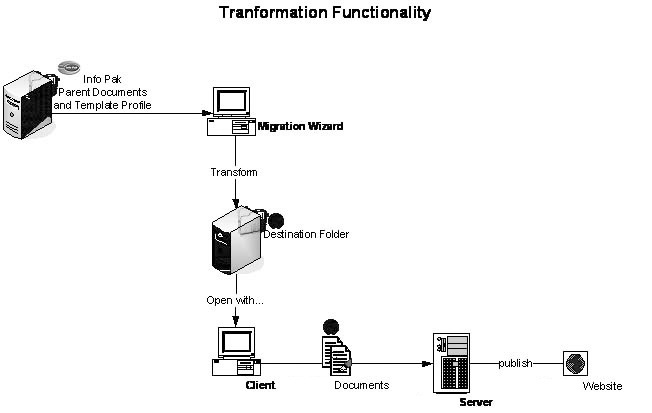 The following diagrams provide an overview of the Migration Wizard dual-mode functionality and the transformation functionality.